Jurgen Klopp made footballing history today as his Liverpool side beat Southampton 3-0 at Anfield to keep up their 100% start to the season. Goals from Joel Matip and Mohamed Salah, as well as an own goal from Saints defender Wesley Hoedt, helped the Merseyside club overcome Mark Hughes’ side and claim their sixth league win in six games this season. And, because of this win, manager Jurgen Klopp enters the footballing history books, as the German is now the only manager ever to win all seven of his side’s opening seven fixtures in all competitions whilst in charge at Anfield. This stat is pretty impressive to say the least, especially when you consider that coaches like Bill Shankly, Rafael Benitez and Bob Paisley all failed to achieve this feat during their time as Liverpool boss. Although the Reds did manage to win 10 of their opening 10 games in the league and League Cup in the 1990-1991 season, they did fail to win in their season opener in the Charity Shield against Man United, something that means Klopp is truly the only Liverpool manager ever to oversee his side win the first seven outings of their season. 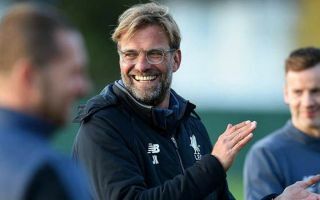 Klopp’s side currently sit two points clear at the top of the Premier League following their home win today, and Liverpool fans may just be believing that this year is their year given how they’ve started this season. Even if Liverpool don’t win the title this season, they will still have Klopp’s record to brag about come the end of the campaign.